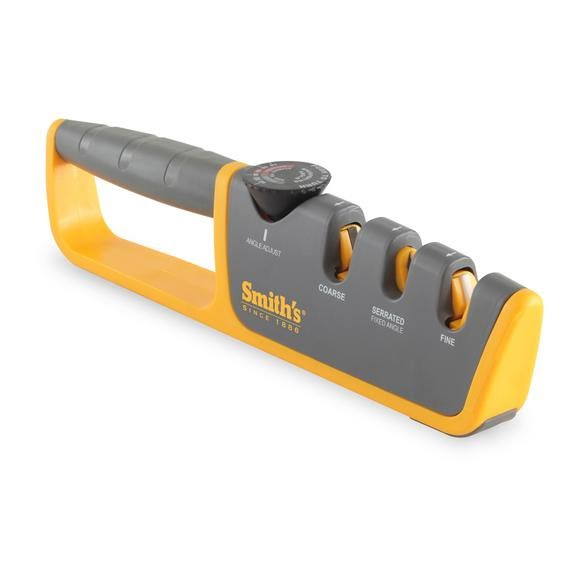 Smith's Adjustable Angle Pull-Thru Knife Sharpener offers new, innovative features never used on a manual knife sharpener and functional performance unmatched by standard edge maintenance products. This sharpener offers two stages of sharpening (COARSE and FINE) for all types of straight edge knives with a grind on both sides of the blade and a fixed-angle slot for sharpening serrated edge blades. Smith&apos;s Adjustable Angle Pull-Thru Knife Sharpener offers new, innovative features never used on a manual knife sharpener and functional performance unmatched by standard edge maintenance products. This sharpener offers two stages of sharpening (COARSE and FINE) for all types of straight edge knives with a grind on both sides of the blade and a fixed-angle slot for sharpening serrated edge blades. It will sharpen a wide variety of knives by simply adjusting the angle of the abrasive components to match the angle of the original factory grind. Just turn the dial to one of the 6 angles offered, then pull your knife through the appropriate slot(s). It&apos;s that easy! Stop messing with those difficult to use, cumbersome, and timely Precision Sharpening Kits and get an Adjustable Angle Pull-Thru Knife Sharpener from Smith&apos;s.
Set the sharpening anlge by pushing down on the top of the adjustment knob and turning to the desired angle. If factory angle is unknown, use the angle chart on the inside of this card or follow suggested angles printed on product and knob.